All is well so far no bugs to report however the same issue I've always had still occurs occasionally. If I'm downloading a big media file like a 120MB mp3. Sometimes it will continuously loop when downloading it. Normally playing it while downloading prevents it. But when pinning it to download it occurs pretty commonly. I've had this issue as far back as I can remember. Any idea? nh5 wrote: All is well so far no bugs to report however the same issue I've always had still occurs occasionally. If I'm downloading a big media file like a 120MB mp3. Sometimes it will continuously loop when downloading it. Normally playing it while downloading prevents it. But when pinning it to download it occurs pretty commonly. I've had this issue as far back as I can remember. Any idea? hi there, i will recheck this. Some times Artist-Title is not send over bluetooth. Weirdly problem is fixed by listening one song in spotify. For what its worth, the issue nh5 is reporting sounds like the same one I reported in the Bugs forum. Where pinned files (often transcoded FLAC) repeat download, I have also noticed that these same files cut off the last second of audio when streaming live.. This does not however happen in the web based player. I do have a song or two that this behavior is repeatable on if you would like me to send a file to you on PM. Clicking the Search icon on the bottom causes the app to crash. Bug report from app has been sent. Also, where should we post bugs to? This Forum or the Google Groups list? As always the new changes are looking really good. Hi there, i have tested with Android 4.4, but i will recheck your report. and problems with released versions in the forum. it would be great if you could add the genre radio functionality that is on the full site. when turning on the Song Shuffle (now called pandora mode) it says "Pandora Mode On" but doesn't load any songs at all, when i press play nothing happens, worked fine in Madsonic 5.5, other then that it seems to work very nicely but i hope this can be fixed soon, as i love this feature of Madsonic! edit: sometimes when i try to press play after enabling pandora mode it says "Pandora-Buffer 0"
You may need to begin playing one song, then turn on Pandora mode. 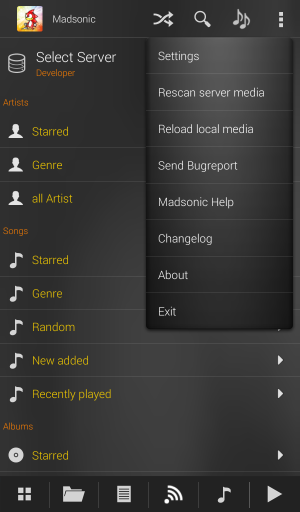 gurutech wrote: You may need to begin playing one song, then turn on Pandora mode. this workaround does get it working, thanks alot. Pandora on the Client works a little bit different as on the Webpage. First, play some Music of your choice. new songs are loaded from the buffer. By moving the song to the last entry, you can pass through songs from the buffer. I hope I haven't confused you more as before. Yes it's there. Go to the welcome (first) page. In the Top bar the first icon is the old shuffle mode.